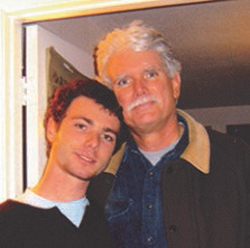 In his recently released book, Seeking Jordan, Matthew McKay, Ph.D., (below) details his efforts to connect with and communicate with his son Jordan, who had been murdered six years earlier, at age 23. 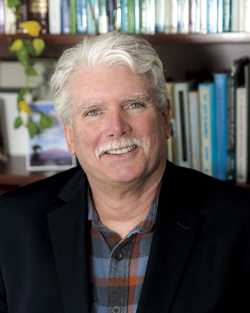 A clinical psychologist and professor at the Wright Institute in Berkeley, Calif., McKay began his journey of discovery with an introduction to induced after-death communication and moved on to channeled (automatic) writing and past-life and between-life regressions. McKay states that he had more than a hundred conversations with Jordan, (below) who told him of his initial awakening in his new realm of existence, reunions with deceased loved ones, and the life review, while also providing various other insights about life and life after death. I recently put some questions to McKay by email for an interview featured in The Searchlight, a publication for the Academy for Spiritual and Consciousness Studies. Dr. McKay, what were your views on life after death prior to beginning your search? Were you familiar with various forms of post-death communication prior to Jordan’s death? What was you attitude toward them? How long did it take you to master channeled writing? Did it require much patience? Were you familiar with it before? To what extent were the messages coming from Jordan new or in conflict with previous beliefs or ideas? If not in conflict, how can you be sure you were not subconsciously providing the answers? If new or in conflict, can you give an example or two? How do your peers in the psychology field react to your interest in psychic matters and your book? How about students? “I’ve shared Jordan’s lessons with very few of my colleagues in psychology. These are people of science who revere randomized controlled trials and the measurement of human experience. But many human experiences can only be described, not measured. They can be given words, but never known in the form of metrics or quantitative analysis. And for these experiences, we must rely on many, independent observations. If Michael Newton hypnotized 7,000 naive subjects, and they all described a similar version of the afterlife, that means something. If thousands of dying people report visits from dead loved ones to help them with the transition, that means something. If Ian Stevenson, interviewing thousands of children who remembered past lives, discovered evidence of those past lives, that means something. If Jordan tells me things about the purpose of life and the structure of the spirit world, and this single observation fits with others who report knowledge of the afterlife, this, too, means something. Do you accept or reject the idea that spirits of the dead can influence us in a positive or negative way and even be the cause of extremely deviant or criminal behavior? If you accept the idea, would you dare to suggest it to your peers, a patient, or to a student? “I believe that spirits of the dead can only influence us in positive ways. Once souls leave the physical plain and go through the re-entry process to the spirit world, they have access to knowledge gleaned from all their previous lives. They know the purpose of life – to learn and gather wisdom – and they are bathed in love. It is not possible for those souls to harm or damage the living. These are myths perpetrated by people who do evil and wish to explain it via the supernatural. How are we so influenced? “Guides from the spirit world, as well as deceased loved ones, exert influence on our choices. They whisper to us through random and strange thoughts, through sudden feelings or urges, to help us make wise choices. Their messages are frequent visitors to our unconscious mind. The ones we love on the other side, as well as masters and guides, are in constant communication. And much of our work on this planet is to tune into our wise mind, or spiritual short wave radio, so we can hear them. Jordan mentioned that certainty is not a healthy state. Is there a point between the blind faith of most religions and absolute certainty that you feel we should strive for relative to a belief that consciousness survives death? “We live in a place where certainty is impossible. Certainty about truth, about right and wrong, often results in holocausts – emotional and societal. We need to hold every belief lightly – as a tentative truth that may later be modified or disproved. The belief that there is an afterlife, that souls are immortal and come here between lives to learn, is not absolute truth. It has been reported by many observers and there is much data to suggest that consciousness can exist outside the body. None-the-less, nothing is certain about what the afterlife looks like or the eternal life of souls. Those of us who have sought to connect, and who have experienced the flooding sense of love from those on the other side have experiences to support the belief that the relationship between the living and the dead is never broken. So many people are turned off to the idea of a higher power and an afterlife when they suffer pain of one kind or another. They claim it is not consistent with a just and loving Creator. What do you say to them? “Jordan has been very clear that pain is a necessary environment for souls to grow. There are lessons we cannot learn without pain. In fact, we come here to learn how to love in the face of pain. This planet is a school that teaches us how to make wise choices when we hurt, and everything around us is threatening us with pain and loss. “Pain is not a sign we are bad or have done wrong. Our work here is not to seek pleasure and avoid suffering. Our work here is to ask the question: ‘What can I learn from this pain? What wisdom, what truth lies at the root of this pain?’ Every choice we make in the face of pain teaches us, and what we learn is uploaded to collective consciousness, to the all, to god. That may very well be the case as far as an individual approach to it goes, but it does not mean that those who are unable to maintain that positive state of mind are not subject to low-level influences. Take a look at Dr. Carl Wickland’s research, as suggested by Jon. I thought his answer about evil spirits was a matter of personal choice, essentially between taking a positive view or a negative one. Where or with which idea (since no one knows for sure anyway and this type of experience being extremely subjective) would you rather place your awareness, your belief? I assume one with a higher awareness, a positive state of mind, focused with belief in the “good”, and regardless of their circumstances or what is true or not, will be in superior position NOT to attract malevolent beings or forces. Excellent answer! And one that we need to talk about more often. Leave the rest and the lesser as far from your consciousness as possible. They/It will disappear fairly quickly… If it even bothers to come around someone like the author of this book at all! I found Dr. McKay’s account of his son’s afterlife both fascinating and persuasive (and encouraging). He should be thanked for relating this. Yet I was troubled by one remark, that there is no evil “out there”. I fear that this belief is a little naïve and even dangerous. There seems to be evidence of malevolence from entities. The current Fortean Times has an article by Alan Murdie, “House of Suicides” in which he relates having been influenced, at age 17, to almost jump from a roof, committing suicide. Not all malevolence results in suicide, it seems. I suspect that revenge, envy and plain mischief occurs more than we realize. And, I suspect that I and probably many others have been victimized. Bad luck can happen, and even careers hampered or ruined. We live in a society in which interpersonal connections are frail. Industrial societies are mobile, and relationships are temporary. People are regarded as means to an end rather than as ends in themselves. (Kant’s Categorical Imperative.) The result is that there is little help in these matters available when needed. Even psychics seem to convey a “do it yourself” recommendation. Others are needed for support and that is a basic human need, not a sign of weakness. The frequent recommendation is “envelop yourself in the white light”. What is one supposed to do, stand under a strong LED fixture? Churches and “the helping professions” offer scant help, and are not substitutes for human caritas and connection. Gary Mannion like Helen Duncan was probably influenced by demonic forces when he cheated. I have often thought that perhaps past-life personalities have some influence on peoples’ behavior and obviously not every past life personality was of a sterling character. Perhaps these past lives are what is seen in multiple personalities, recognizing of course that not every diagnosis of multiple personality is a true multiple personality. I also think that past life personalities play out in mental illnesses even those seeming relatively non-exotic illnesses such as depression and anxiety. Have you ever looked at Channeling Erik? I can’t remember if we have communicated about that, Michael. It’s an ongoing dialogue between a mother and her son, Erik, who took his own life in October 2009. They communicate via one or more mediums. Here is a short conversation they had about possession. “Me: is Erik’s mother, Elisa Medhus M.D. Jamie is the medium. Me: Okay, a lot of people have asked this one, Erik. It’s about possession. Can spirits possess the bodies of humans? I’m talking about demonic or non-demonic spirits. Erik (chuckling): Is this the part of the book when you need to warn people whether they should read forward or not? Me: Maybe. I guess it all hangs on what you say, Sweetie! Erik: Yes. Yes they can. Possessions do happen, demonic and non-demonic. Erik: Sure. Just as there are evil people, there are evil spirits. After all, there’s still free will. A switch doesn’t get hit that’ll make you all knowing and great ad helpful just because you leave the body. Me: Ah! Okay. Too bad. Erik: You still have the free will to use that power to pull people away from Light. Erik: There are entities who thrive on that. They thrive on separation, on fear, on negative energy. Me: So what about multiple personalities? Do these have something to do with possessions? Erik: Yeah, it can and it usually is. Me: Well, what about benevolent possessions? Can spirits possess a human to help out? Erik: —or if something really traumatic happens, maybe right before they die. Those are two of the examples I can come up with now. Me: Okay, let’s see. Next question. Is there any such thing as a demonic possession? Erik: Yeah, there is. There is. Me: Okay, can you expand on that a bit? Erik: From what I understand—and I have my angel standing next to me to step in if I say something that’s not right. Erik: But it’s my understanding that there’s light and there’s dark, and if someone concentrates or focuses on the dark too much, it can come in and take over. It causes a lot of mental illness. It can cause a lot of pain. I thought about it, you know, and I wondered about it for myself. Me: Wow, so you thought you were possessed at one point? Erik: Well, I didn’t really think I was possessed, but I wondered, because I was so… conflicted—all those emotions running around. I agree with you 100%. When I read Dr. McKay’s response to that question, I was quite surprised and wondered how he came to that conclusion and if his response was based solely on what Jordan had communicated to him. I further wondered if he is aware of Wickland and all the other researchers who have come to a different conclusion. However, as a reporter, I was just relaying his answers to my email questions and wasn’t prepared to get into a lengthy email discussion on the matter with him, especially since I had already exceeded my desired word length. Yes I agree Michael; Nice interview. What do you think about Matthew’s statement, “I believe that spirits of the dead can only influence us in positive ways.” Can that really be the case? There is centuries of evidence and suggestion that certain people can and are influenced negatively by deceased people. Evidence for this has been demonstrated in Spirit Release Therapy, books such as Carl Wickland’s “Thirty Years among the Dead,” people with schizophrenia who are often seemingly influenced by negative influences, etc. The list goes on. This is not to mention the hundreds of thousands of exorcisms carried out in places such as Italy every year. Is he saying not a single one of these is the result of a negative influence by a discarnate? Then of course there are all the religious references, biblical and otherwise, that speak about casting out demons. They could of course all be bogus. We also often read about people with addictions being influenced by low-level entities because their psychological immune system is depleted. Can it be that there is no truth in any of this? What are your thoughts? Maybe you could ask Matthew to comment.